Bruce Springsteen has never lived up to his nickname of ‘The Boss’ more than in the last decade, Getintothis’ Alan O’Hare gives us a top ten from one of rock ‘n roll’s living legends. 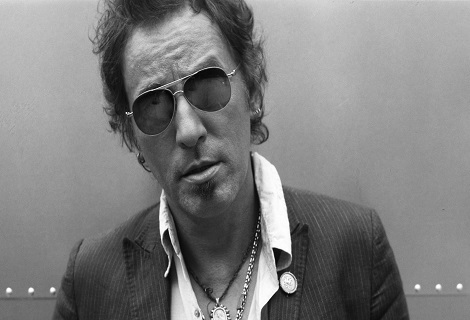 Bruce Springsteen releases his 18th studio album this week. High Hopes is very different to what’s come before it – but that’s Springsteen all over. The blue collar boy from New Jersey – 64 years of age on his last birthday – has never trod a familiar path. Signed to Columbia Records by John Hammond (track record: Aretha Franklin and Bob Dylan) as a solo acoustic troubadour, his first two albums straddled a fine line between the sounds of a singer/songwriter and that of a bandleader. There were bass, drums, pianos, organs and Clarence Clemons’ trademark saxophone gospel riffs. But it was the writer’s lyrical content that really stood out. That was until 1975, however, and the release of Born To Run. A stone cold classic, Springsteen’s third album set him and his E Street Band on the road to musical superstardom and they’ve never looked back since. 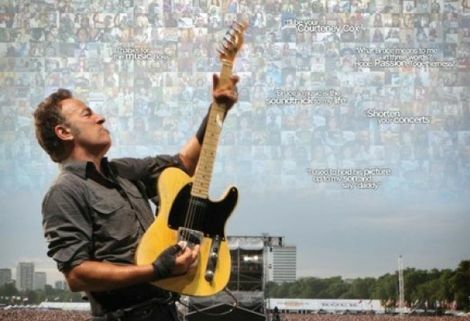 Recognised game changers such as Darkness On The Edge Of Town (1978) and The River (1980) followed and Springsteen’s message left America and travelled across the Atlantic Ocean for the first time. The haunting and genuinely unique Nebraska (1982) set Springsteen apart in the early 1980s – before Born In The USA (1984) made him swim the mainstream with the likes of Madonna and Prince. His gigs were still the very best you could see – up to three hour marathons of everything rock ‘n roll ever promised – but Bruce felt his art was compromised. He turned down millions of dollars from advertisers for his music, ignored lucrative tour sponsorships and declared his massive audience as “transient”. All this resulted in his step back from MTV and his step into classic songwriter shoes, with the unbelievable Tunnel Of Love album in 1987. A set of songs so honest that perhaps only Dylan’s Blood On The Tracks and John Lennon’s Plastic Ono Band could compare with it, Tunnel Of Love represented the very best of Bruce’s confessional song writing and remains a brilliant anomaly in his recorded work. The 90s weren’t kind to Springsteen – he rarely worked with the E Street Band – but 1995’s acoustic sounding The Ghost Of Tom Joad, alongside the Oscar-winning single Streets Of Philadelphia, brought with them a creative rebirth. Great records like The Rising (2002) and Magic (2007) followed with the band, while Springsteen continued to scratch his travelling troubadour itch with releases such as Devils & Dust (2005) and We Shall Overcome: The Seeger Sessions (2006). 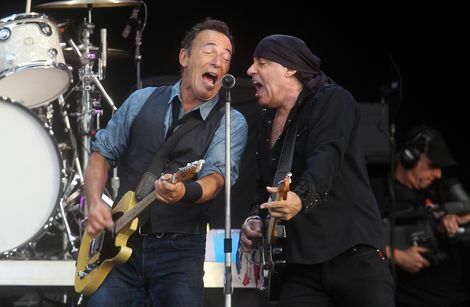 The Boss has put out records at a frightening pace in the last decade and, while quality control may slip from the very highest of standards now and again, his releases remain more vital than any of his peers. Wrecking Ball took a shot at the distance between the American dream and the American reality in 2012 and sided with the Occupy Wall Street movement behind a barrage of loops, voices and melodic tunes. And now, hot on the heels of a mammoth world tour, comes High Hopes. 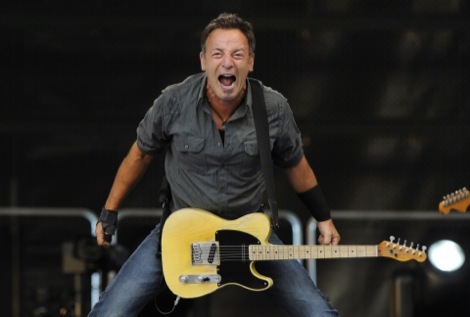 Rage Against The Machine’s Tom Morello has been cited as Springsteen’s muse on the project (he played guitar with the band on 2013’s Australian tour) and indeed plays and sings on half of its tracks. There are covers, live favourites that have never been recorded with the E Street Band and outtakes from the last decade’s records. High hopes? Springsteen has never had anything else. This is where it all really starts. The clip that has it all and shown for years on UK television on The Old Grey Whistle Test before Springsteen ever toured the UK. Watch the girl run on stage around the seven minute mark: the power, mystery and majestery of rock ‘n’ roll. Breathtaking. From 1975’s breakthrough Born To Run, Thunder Road is the very first invitation Bruce Springsteen sent the mainstream to come join his club. The piano introduction, the Walt Whitman-esque poetry, those drums and guitars… and those glorious blasts of saxophone that have influenced everyone from R.E.M. to The Killers ever since. Enjoy. By his third album, 1978’s Darkness On The Edge Of Town, Springsteen had stripped back his lyrics and sound to the very core of his band. But the live performances of the songs from the record that contained perhaps his best set of songs,have always remained feral. Getintothis defies anyone to remain seated as Badlands gets New York City onto its feet over 20 years after its release. It’s all about cars and girls… right? Wrong. Get yourself a stiff drink, sit down and listen to this. 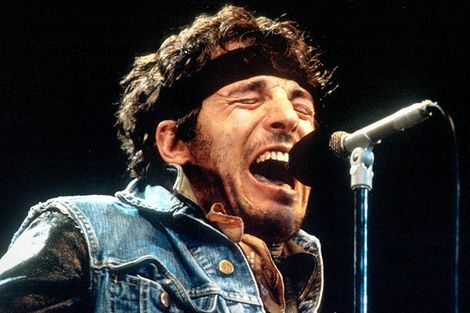 And when The Boss gets to the final verse about “staring off alone into the night with the eyes of one who hates for just being born” and the E Street Band play one of the most glorious codas you’ll ever hear, forget all about what you ever thought you knew about Springsteen’s music. He loves a title track does Bruce. And they don’t come much better than this, from 1980’s double album, The River. Springsteen’s lyrics really changed around this time – the larger than life characters from the Jersey shore were gone forever – and tightened up to tell real life stories. This, one of his very best, was inspired by the struggles of his sister and her out of work husband. “We went down to the court house and the judge put it all to res” he sings of a shotgun wedding. And some critics say his song writing is too romantic! Tip: watch to the end for the ethereal howl and steam rising; a great Glastonbury moment. Springsteen carried a cassette tape in his back pocket in 1981. It contained the demos for his next album – he’d recorded them solo, at home, and wanted the E Street Band to improve them in the studio. They couldn’t. Spot the deliberate mistakes: yes, we’ve bypassed Born In The USA and (yes, again) this is a video, as opposed to a live recording. But what a video – with Springsteen singing live, in his kitchen, as one single shot cuts closer and closer to his face. This is how the artist chose to follow his biggest commercial success – by removing every barrier brought by superstardom. This is the sound of the post-reunion E Street Band being born. The song, in which Springsteen details every war the working class of America have been asked to fight, is devastating. When he sings “… those big boys did what Hitler couldn’t do” he reveals his song writing as the conscience of a nation. The Rising has been dubbed Springsteen’s ‘response to 9/11’. While that may be a crass description of The Boss’ first state of the nation address of the new Millennium, there is no denying the ache contained within this heartbreaking lament. New album High Hopes is laden with Pro Tools tinkering: samples here, drum machines there and distorted vocals everywhere. In truth, early listens suggest there may be too much of it this time. But, on 2012’s Wrecking Ball, Springsteen mixed the modern sounds of today with his rock and soul past (the horns and organ on this are beyond beautiful) perfectly. Featuring Michelle Moore, Rocky Ground is the latest undeniably great song added to Bruce’s brimful back catalogue.